Jesus lists the sin of pride among "adulteries, fornications, murders, thefts, covetousness, wickedness, deceit, lasciviousness, an evil eye, blasphemy, and foolishness" so we need to be extremely careful to never be proud in our day to day lives. Here are some Bible verses to examine about the sin of pride. The wicked are too proud to seek God. They seem to think that God is dead (Psalm 10:4 NLT). May the Lord cut off all flattering lips, and the tongue that speaks proud things (Psalm 12:3 NKJV). Love the Lord, all you his saints! The Lord preserves the faithful but abundantly repays the one who acts in pride (Psalm 31:23 ESV). Whoever secretly slanders his neighbor, Him I will destroy; The one who has a haughty look and a proud heart, Him I will not endure (Psalm 101:5 NKJV). When pride comes, then comes disgrace, but with the humble is wisdom (Proverbs 11:2 ESV). Only by pride cometh contention: but with the well advised is wisdom (Proverbs 13:10). A fool’s proud talk becomes a rod that beats him, but the words of the wise keep them safe (Proverbs 14:3 NLT). The Lord tears down the house of the proud, but he protects the property of widows (Proverbs 15:25 NLT). The Lord detests the proud;they will surely be punished (Proverbs 16:5 NLT). 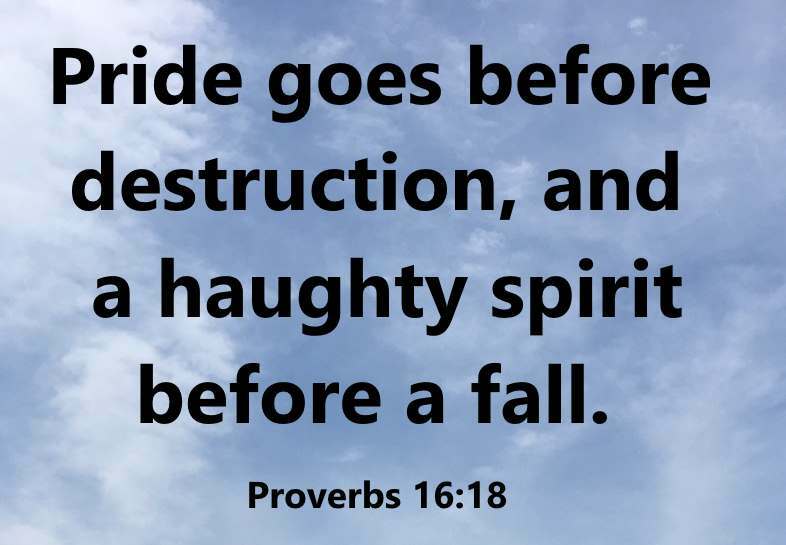 Pride goes before destruction, and a haughty spirit before a fall (Proverbs 16:18 ESV). It is better to be of a lowly spirit with the poor than to divide the spoil with the proud (Proverbs 16:19 ESV). Haughty eyes, a proud heart, and evil actions are all sin (Proverbs 21:4 NLT). He who is of a proud heart stirs up strife, But he who trusts in the Lord will be prospered (Proverbs 28:25 NKJV). One's pride will bring him low, but he who is lowly in spirit will obtain honor (Proverbs 29:23 ESV). Better is the end of a thing than the beginning thereof: and the patient in spirit is better than the proud in spirit (Ecclesiastes 7:8). I, the Lord, will punish the world for its evil and the wicked for their sin. I will crush the arrogance of the proud and humble the pride of the mighty (Isaiah 13:11 NLT). Hear ye, and give ear; be not proud: for the Lord hath spoken (Jeremiah 13:15). For behold, the day is coming, Burning like an oven, And all the proud, yes, all who do wickedly will be stubble. And the day which is coming shall burn them up,” Says the Lord of hosts, “That will leave them neither root nor branch" (Malachi 4:1 NKJV). For from within, out of the heart of men, proceed evil thoughts, adulteries, fornications, murders, Thefts, covetousness, wickedness, deceit, lasciviousness, an evil eye, blasphemy, pride, foolishness: All these evil things come from within, and defile the man (Mark 7:21,22,23). But He gives more grace. Therefore He says: God resists the proud, But gives grace to the humble (James 4:6 NKJV). For all that is in the world - the desires of the flesh and the desires of the eyes and pride of life - is not from the Father but is from the world (1 John 2:16 ESV).